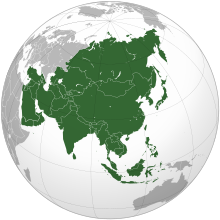 This is a list of Asian cuisines, by region. A cuisine is a characteristic style of cooking practices and traditions, usually associated with a specific culture or region. Asia, being the largest and most populous continent, has many great cuisines. Location of Central Asia. In some definitions, it also includes Afghanistan (south of area shown). Central Asian cuisine includes food from Kazakhstan, Kyrgyzstan, Tajikistan, Turkmenistan and Uzbekistan. Kazakh cuisine – cuisine of Kazakhstan. Traditional Kazakh cuisine revolves around mutton and horse meat, as well as various milk products. For hundreds of years, Kazakhs were herders who raised fat-tailed sheep, Bactrian camels, and horses, relying on these animals for transportation, clothing, and food. Kyrgyz cuisine – originating in Kyrgyzstan, is similar in many respects to that of its neighbors, particularly Kazakh cuisine. Traditional Kyrgyz food includes mutton and horse meat, as well as milk products. The cooking techniques and major ingredients have been strongly influenced by the nation's nomadic way of life. Tajik cuisine – traditional cuisine of Tajikistan, has much in common with Afghan, Russian, and Uzbek cuisines. Plov, also called osh, is the national dish in Tajikistan, as in other countries in the region. It consists of chunks of mutton, carrots and rice fried in a large cast-iron cauldron similar to a Dutch oven. Green tea is the national drink. Traditional Tajik meals start with a spread of dried fruit, nuts, halva, and other sweets arrayed on the table in small dishes, and then progress to soup and meat, before finishing with plov. Turkmen cuisine – cuisine of Turkmenistan. It is similar to that of the rest of Central Asia. Plov is the staple, everyday food, which is also served at celebrations. Turkmenistan is perhaps most famous for its melons, especially in the former Soviet Union, where it was once the major supplier. Meals are almost always served with naan, Central Asian flat bread, known locally as "çörek." Uzbek cuisine – cuisine influenced by local agriculture, as in most nations. There is a great deal of grain farming in Uzbekistan, so bread and noodles are of importance, and Uzbek cuisine has been characterized as "noodle-rich". Mutton is a popular variety of meat due to the abundance of sheep in the country and it is a part of various Uzbek dishes. Uzbekistan's signature dish is palov (osh) made with rice, pieces of meat, grated carrots and onions. Horse meat platter. Kazakh cuisine revolves around mutton, horse meat and various milk products. East Asian cuisine has evolved with common usage of oils, fats and sauces in the preparation of dishes (with the notable exception of Japanese cuisine). Chinese cuisine – Traditional Chinese cuisines include Anhui, Cantonese, Fujian, Hunan, Jiangsu, Shandong, Sichuan, and Zhejiang, all of which are defined and termed per the respective regions within China where they developed. A number of different styles contribute to Chinese cuisine, but perhaps the best known and most influential are the Sichuan, Shandong, Jiangsu and Guangdong cuisines. These styles are distinctive from one another due to factors such as available resources, climate, geography, history, cooking techniques and lifestyle. Many Chinese traditional regional cuisines rely on basic methods of food preservation such as drying, salting, pickling and fermentation. Chinese cuisine originated in what is known as the Eight Great Traditions, though it can be generalized into northern styles that feature oils and strong flavors derived from ingredients such as vinegar and garlic, while southern styles tend to favor fresh ingredients that are lightly prepared. It has become widespread throughout many other parts of the world — from Asia to the Americas, Australia, Western Europe and Southern Africa. In recent years, connoisseurs of Chinese cuisine have also sprouted in Eastern Europe and South Asia. American Chinese cuisine and Canadian Chinese food are popular examples of local varieties. Local ingredients would be adopted while maintaining the style and preparation technique. Anhui is derived from the native cooking styles of the Huangshan Mountains region in China and is similar to Jiangsu cuisine. It is known for the use of wild herbs, from both land and sea, and simple methods of preparation. 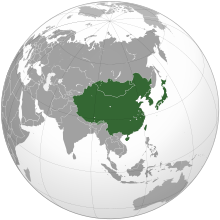 Cantonese comes from Guangdong Province in southern China. Due to Guangdong's location on the southern coast of China, fresh live seafood is prominent in Cantonese cuisine. Canton has long been a trading port and many imported foods and ingredients are used in Cantonese cuisine. Char siu is a popular way to flavor and prepare pork in Cantonese cuisine. Fujian is one of the native Chinese cuisines derived from the native cooking style of the province of Fujian, China. Many diverse seafoods and woodland delicacies are used, including a myriad of fish, shellfish and turtles, along with edible mushrooms and bamboo shoots, provided by the coastal and mountainous regions of Fujian. Hunan, sometimes called Xiang cuisine, consists of the cuisines of the Xiang River region, Dongting Lake and western Hunan Province, in China. The cuisine is well known for its hot spicy flavor, fresh aroma and deep color. Common cooking techniques include stewing, frying, pot-roasting, braising, and smoking. Due to the high agricultural output of the region, ingredients for Hunan dishes are many and varied. Jiangsu is derived from the native cooking styles of the Jiangsu region in China. Food texture is often soft, but not to the point of mushy or falling apart. Other characters include the strict selection of ingredients according to the seasons, emphasis on the matching color and shape of each dish and emphasis on using soup to improve the flavor. Shandong in Chinese is more commonly known as Lu cuisine, and is derived from the native cooking styles of Shandong, an eastern coastal province of China. Possibly Shandong's greatest contribution to Chinese cuisine has been in the area of brewing vinegar. Hundreds of years of experience combined with unique local methods have led to Shandong's prominence as one of the premier regions for vinegar production in China. 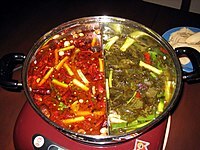 Sichuan is a style of Chinese cuisine originating in the Sichuan Province of southwestern China famed for bold flavors, particularly the pungency and spiciness resulting from liberal use of garlic and chili peppers, as well as the unique flavor of the Sichuan peppercorn (花椒). Peanuts, sesame paste, and ginger are also prominent ingredients in Sichuan cooking. Zhejiang is derived from the native cooking styles of the Zhejiang region in China. Food made in the Zhejiang style is not greasy, having instead a fresh and soft flavor with a mellow fragrance. Four Great Traditions – often considered the standouts of Chinese cuisine and due to their influence are proclaimed as the Four Great Traditions (四大菜系, Sì Dà Cài Xì). Huaiyang cuisine – often viewed as the representation of the entire Jiangsu cuisine. Hong Kong cuisine is mainly influenced by Cantonese cuisine, non-Cantonese Chinese cuisine (especially Teochew, Hakka, Hokkien and the Jiangsu & Zhejiang), the Western world, Japan, and Southeast Asia, due to Hong Kong's past as a British colony and long history of being an international city of commerce. Fish balls, Wonton noodle, Egg waffle, and milk tea are some of the most notable dishes, snacks, and drinks. Kaiseki is a traditional multi-course Japanese dinner. The term also refers to the collection of skills and techniques used in the preparation of such meals, and are analogous to Western haute cuisine. Japanese cuisine is known for its emphasis on seasonality of food (旬, shun), quality of ingredients and presentation. Japanese regional cuisine includes a vast array of regional specialities known as kyōdo ryōri in Japanese, many of them originating from dishes prepared using local ingredients and traditional recipes. Sushi and sashimi are both part of the cuisine of the island nation. The Michelin Guide has awarded Japanese cities by far the most Michelin stars of any country in the world (for example, Tokyo alone has more Michelin stars than Paris, Hong Kong, New York, LA and London combined). Traditional cooking methods eschew the use of oils and fats, with a focus on featuring the delicate flavors of the natural ingredients. Due to an abundant seafood supply, the traditional Japanese diet featured minimal use of meat; however, modern Japanese cuisine includes an extensive variety of popular meat dishes. Japanese cuisine offers a vast array of regional specialties that use traditional recipes and local ingredients. Okinawan cuisine is the cuisine of the Japanese island of Okinawa. Due to the difference in culture, climate, vegetables and other ingredients between Okinawa and mainland Japan, Okinawan cuisine is very different from Japanese cuisine. The cuisine incorporated influence from Chinese cuisine and Southeast Asian cuisine due to trade. The sweet potato, introduced in Okinawa in 1605, became a staple food there until the beginning of the 20th century. An article about Okinawan food written by Kikkoman stated that Goya (bitter melon) and Nabera (luffa or towel gourd) were "likely" introduced to Okinawa from Southeast Asia. Since Ryūkyū had served as a tributary state to China, Okinawan cooks traveled to Fujian Province to learn how to cook Chinese food; Chinese influence seeped into Okinawa in that manner. The same Kikkoman article states that the method of distillation of awamori likely originated from Siam (Thailand) and traveled to Okinawa during the 15th century. After the lord of the Kagoshima Domain subjugated Ryūkyū, Okinawan cooks traveled to Japan to study Japanese cuisine, causing that influence to seep into Okinawan cuisine. Korean cuisine originated from ancient prehistoric traditions in the Korean peninsula, evolving through a complex interaction of environmental, political, and cultural trends. Korean cuisine is largely based upon rice, vegetables, and meats. Traditional Korean meals are noted for the number of side dishes (banchan) that accompany steam-cooked short-grain rice. Kimchi is served often, sometimes at every meal. Commonly used ingredients include sesame oil, doenjang (fermented bean paste), soy sauce, salt, garlic, ginger, pepper flakes, and gochujang (fermented red chili paste). Korean regional cuisine (Korean: hyangto eumsik, literally "native local foods"), is characterized by local specialties and distinctive styles within Korean cuisine. The divisions reflected historical boundaries of the provinces where these food and culinary traditions were preserved until modern times. Korean barbecue, or gogi gui, refers to the Korean method of grilling beef, pork, chicken, or other types of meat. Such dishes are often prepared at the diner's table on gas or charcoal grills that are built into the center of the table itself. It features cooking methods such as sautéing and what is known in the West as barbecue. Strong flavors featuring spices derived from chili peppers can also be found in dishes such as kimchi. Mongolian cuisine – local culinary traditions of Mongolia and Mongolian styled dishes. 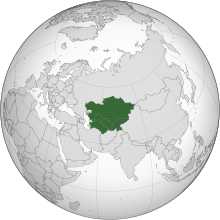 The extreme continental climate has affected the traditional diet, so the Mongolian cuisine primarily consists of dairy products, meat, and animal fats. Use of vegetables and spices are limited. Taiwanese cuisine – Majority Han Taiwanese cuisine and the Aboriginal Taiwanese cuisine, however mixed with part of Japanese cuisine. Due to Guangdong's location on the southern coast of China, fresh live seafood is a specialty in Cantonese cuisine. South Asian cuisine includes the cuisines from the Indian subcontinent and when included in the definition, also that of Afghanistan. It has roots in South Asia, including practices taken from the Hindu beliefs practiced by the large population found in the region, alongside in some regional cuisines, certain influences from neighboring regions and cultures, particularly from Muslim cultures of the Middle East and Central Asia. Dishes in this area of the world are known for their use of hot peppers, black pepper, cloves, and other strong spices along with the flavored butter ghee. Common meats include lamb, goat and chicken; beef is not as common as in western cuisines because the tenets of the Hindu faith prohibit its consumption. Other staples of many of the cuisines include rice, chapati made from wheat and barley, and beans. The cuisine of South Asia has mostly indigenous roots, as well as practices taken from the Hindu beliefs practiced by the large population found in the region. Naan, a type of flat bread from the former regions, is a common part of meals in many parts of South Asia. Afghan cuisine – cuisine of the Afghan people, largely based upon Afghanistan's chief crops: cereals like wheat, maize, barley and rice. Accompanying these staples are dairy products (yogurt and wheat), various nuts, and native vegetables, as well as fresh and dried fruits. Lamb is the primary meat for many Afghans, although Turkic peoples also eat horse. Afghanistan is also well known for its grapes. Bangladeshi cuisine is dominated by Bengali cuisine and has been shaped by the diverse history and riverine geography of Bangladesh. The country has a tropical monsoon climate. Rice is the main staple food of Bangladeshi people and it is served with a wide range of curries. Sublime Bangladeshi dishes exhibit strong aromatic flavours; and often include eggs, potatoes, tomatoes and aubergines. A variety of spices and herbs, along with mustard oil and ghee, is used in Bangladeshi cooking. The main breads are naan, porota, roti, bakarkhani and luchi. Dal is the second most important staple food which is served with rice/porota/luchi. Fish is a staple in Bangladeshi cuisine, especially freshwater fish, which is a distinctive feature of the country's gastronomy. Major fish dishes include ilish (hilsa), pabda (butterfish), rui (rohu), pangash (pangas catfish), chitol (clown knifefish), magur (walking catfish), bhetki (barramundi) and tilapia. Meat consumption includes beef, lamb, venison, chicken, duck, squab and koel. Vegetable dishes, either mashed (bhorta), boiled (sabji), or leaf-based (saag), are widely served. Seafood such as lobsters and shrimps are also often prevalent. Bhutanese cuisine employs a lot of red rice (like brown rice in texture, but with a nutty taste, the only variety of rice that grows at high altitudes), buckwheat, and increasingly maize. The diet in the hills also includes chicken, yak meat, dried beef, pork, pork fat, and mutton. When offered food, one says meshu meshu, covering one's mouth with the hands in refusal according to Bhutanese manners, and then gives in on the second or third offer. Indian cuisine is characterized by its sophisticated and subtle use of many Indian spices and vegetables, herbs, and fruits grown across India. There is also the widespread practice of vegetarianism across its society. Considered by some to be one of the world's most diverse cuisines, each family of this cuisine is characterized by a wide assortment of dishes and cooking techniques. As a consequence, Indian cuisine varies from region to region, reflecting the varied demographics of the ethnically diverse Indian subcontinent. India's religious beliefs and culture has played an influential role in the evolution of its cuisine. However, cuisine across India has also evolved with the Indian subcontinent's cross-cultural interactions with the neighboring Middle East, Southeast Asia, East Asia, and Central Asia, making it a unique blend of various cuisines across Asia. The colonial period introduced European cooking styles to India adding to its flexibility and diversity. Indian cuisine has also influenced cuisines across the world, especially those from Southeast Asia. In particular, curry has been widely adopted in cuisines around the world. Kerala cuisine - Sadhya means "banquet" in Malayalam. 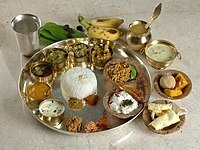 It is a typical feast of the people of Kerala. Bengali cuisine is a style of food preparation originating in Bengal, a region in eastern South Asia which is now divided between the Indian states of West Bengal, Tripura, and Barak Valley of Assam and the independent country of Bangladesh. Bengali food has inherited a large number of influences, both foreign and South Asian, arising from historical and strong trade links with many parts of the world. East Indian Cuisine (East Indians are an ethnic group from Bombay in the West of India) The East Indian cuisine is distinct to the community and includes delicacies such as the vajri curry or goat tripe curry, chicken tope, sorpotel, khudi curries and many more. Some of the popular Afghan dishes, from left to right: 1. Lamb grilled kebab (seekh kabab); 2. Kabuli palaw and salad; 3. Tandoori chicken; and 4. Mantu (dumplings). Traditional Bangladeshi meal: mustard seed ilish curry, Dhakai biryani and pitha; similar to East Indian cuisine. South Indian style vegetarian thali. North Indian style vegetarian thali. Pork vindaloo is a popular curry dish from the Indian state of Goa and around the world. Dal-bhat-tarkari is a traditional dish in Nepalese cuisine and an Indian Gorkha staple. Southeast Asian cuisine emphasizes lightly prepared dishes with strong aromas, featuring such flavors as citrus, mint, coriander (also known as Chinese parsley), and basil. Ingredients in the region contrast with the ones in the Eastern Asian cuisines, substituting fish sauces for soy sauce and including such ingredients as galangal, tamarind and lemongrass. Cooking methods include stir frying, boiling and steaming. Bruneian cuisine is similar to, and heavily influenced by, the cuisine of neighboring Malaysia, Singapore, and Indonesia, with additional influences from India, China, Thailand, and Japan. Burmese cuisine has been influenced greatly by China, India and Thailand. However, Burmese cuisine has retained unique preparation techniques and distinct flavors, and there are many regional variations of "standard" dishes. The Burmese eat with their right hand, forming rice into a small ball with only the fingertips and mixing this with various morsels before popping it into their mouths. The Burmese eat a great variety of vegetables and fruits, and all kinds of meat. A very popular vegetable is the danyin thi, which is usually boiled or roasted and dipped in salt, oil and sometimes, cooked coconut fat. Cambodian cuisine is another name for the foods and cuisine widely consumed in Cambodia. The food of Cambodia includes tropical fruits, rice, noodles, drinks, dessert and various soups. Cuisine of East Timor is the cuisine of one of the newest Southeast Asian countries. 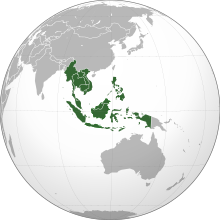 Eurasian cuisine of Singapore and Malaysia is characterized by Portuguese, Dutch, British, Chinese, Malay, and also Indian and Peranakan influences. Within this cuisine ingredients in European dishes are replaced or complemented by Asian ingredients. The other way around, European ingredients are used in Asian dishes. Filipino cuisine has evolved over several centuries from its Austronesian origins to a mixed cuisine with many Hispanic, Chinese, American, and other Asian influences adapted to indigenous ingredients and the local palate. For more information refer to: Filipino cuisine; regional specialties. Kapampangan cuisine is the cuisine native to the Kapampangan people originating from the province of Pampanga, in Central Luzon. One of the best examples of Kapampangan dish is sisig, which is a popular dish across the Philippines. Indonesian cuisine is diverse, in part because Indonesia is composed of approximately 6,000 populated islands. Many regional cuisines exist, often based upon cultural and foreign influences. For example, Sumatran cuisine often has Middle Eastern and Indian influences, featuring curried meat and vegetables, while Javanese cuisine and Sundanese cuisine are more indigenous. Balinese cuisine is the cuisine and culinary traditions of Balinese people from the volcanic island of Bali. Batak cuisine is the cuisine and cooking traditions of Batak ethnic groups, predominantly found in North Sumatra region. Indonesian Chinese cuisine is characterized by the mixture of Chinese with local Indonesian style. Chinese Indonesians bring their Chinese cuisine legacy. Javanese cuisine is the cuisine of Javanese people. In wider sense, Javanese cuisine might also refer to the cuisine of the whole people of Java Island, Indonesia; which also includes Sundanese in West Java, Betawi in Jakarta and Madurese on Madura Island off East Java. Sundanese cuisine is the cuisine of Sundanese people of West Java, Indonesia. In Sundanese restaurants, it is common to eat with one's hands. They usually serve kobokan, a bowl of tap water with a slice of lime for handwashing. Padang food, also known as Minangkabau cuisine, is the cuisine of the Minangkabau people of West Sumatra, Indonesia. It is among the most popular food in Maritime Southeast Asia. It is known across Indonesia as Masakan Padang. Laotian cuisine is the cuisine of Laos, which is distinct from other Southeast Asian cuisines. Laos shares borders with neighboring countries and as a result, Lao cuisine has strongly influenced the neighboring cuisine of Northeastern Thailand (Isan) and some Lao culinary influences have also reached Cambodia and Northern Thailand (Lanna). Malaysian cuisine reflects the multicultural aspects of Malaysia. Various ethnic groups in Malaysia have their own dishes, but many dishes in Malaysia are derived from multiple ethnic influences. Spices, aromatic herbs and roots are all used in Malaysian cuisine. Peranakan cuisine combines Chinese, Malay and other influences into a unique blend. Singaporean cuisine is indicative of the ethnic diversity of the culture of Singapore, as a product of centuries of cultural interaction owing to Singapore's strategic location.the predominant Chinese, Indonesian, Indian and Western traditions (particularly English) since the founding of Singapore by the British in the 19th century. Thai cuisine can be described as four regional cuisines corresponding to the four main regions of the country: Northern, Northeastern (or Isan), Central, and Southern. A fifth cuisine is Thai cuisine, based on the palace cuisine of the Ayutthaya kingdom (1351–1767 CE), which was influential upon the cuisine of the Central Thai plains. Each cuisine has similarities to foods and cuisines in neighboring countries and regions, including the Cuisine of Burma, Yunnan cuisine, Lao cuisine, Cambodian cuisine and Malaysian cuisine. Vietnamese cuisine is a style of cooking derived from Vietnam with Chinese influence. Fish sauce, soy sauce, rice, fresh herbs, fruits and vegetables are commonly used. Vietnamese recipes utilize a diverse range of herbs, including lemongrass, mint, Vietnamese mint, long coriander and Thai basil leaves. Personal serving of Nasi Bali, in Indonesia, rice surrounded by numbers of side dishes including sate lilit. Thai Kaeng phet pet yang: roast duck in red curry. Philippine adobo is a popular Filipino dish and cooking process in Filipino cuisine. Malaysian nasi lemak, is served with anchovies, peanuts, boiled egg, lamb curry, cucumber, and sambal. Food stall in Chiang Mai, Thailand selling ready-cooked food. Bò 7 món (literally "seven courses of beef" in Vietnamese) is a set selection of beef dishes in Vietnamese cuisine. West Asian cuisine, is the cuisine of the various countries and peoples of West Asia. Despite their similarities, there are considerable differences in climate and culture, so the term is not definitive. The cuisine of the region is diverse while having a degree of homogeneity. Many West Asian dishes are made with a paste called tahini. Tahini is a sesame paste made with hulled seeds, unlike its East Asian counterpart. It is used to make such popular meze, or appetizers, as baba ghanoush and hummus along with pungent dipping sauces served with falafel, keftes or kofta and vegetables. Hummus is made from chickpeas, which are staples of the diet. Some commonly used ingredients include olives and olive oil, lamb, pitas, honey, sesame seeds, dates, sumac, chickpeas, mint and parsley. Some popular dishes include kibbeh and shawarma. 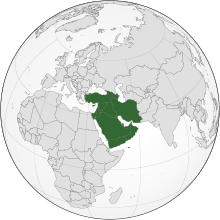 Arab cuisine of the Persian Gulf - Arab cuisine of the Persian Gulf today is the result of combination of diverse cuisines, incorporating Levantine, Indian, Chinese, and Persian cooking styles, and many items not originally indigenous to the Persian Gulf region, which were most probably imported on the dhows and the caravans. Bahraini cuisine refers to the cuisine of The Kingdom of Bahrain, a small island state near the western shores of the Persian Gulf. Bahrain produces only a small amount of its food requirements due to limited land space, and imports much of its food. Its primary crops are dates, bananas, citrus fruits, pomegranates, mangoes, cucumbers and tomatoes. Iranian cuisine - Persian cuisine is diverse, with each province featuring dishes, culinary traditions and styles distinct to its region. Iraqi cuisine or Mesopotamian cuisine, has a long history going back some 10,000 years - to the Sumerians, Babylonians and Assyrians. Tablets found in ancient ruins in Iraq show recipes prepared in the temples during religious festivals - the first cookbooks in the world. Kurdish cuisine consists of a wide variety of foods prepared by the Kurdish people that have got many traditions from their homeland, Kurdistan. Kuwaiti cuisine - the national dish of Kuwait known as machboos (Arabic: مكبوس‎) consists mainly of mutton or chicken placed over or mixed in a large mass of well-cooked and prepared rice. Omani cuisine is generally very simple, with the aid of many spices and marinades to complete a dish, which usually consists of chicken, fish, and mutton. Unlike many other Asian nations, Omani cuisine is not spicy, and varies between regions. Saudi Arabian cuisine - Food staples include lamb, grilled chicken, falafel (deep-fried chickpea balls), shawarma (spit-cooked sliced lamb), mutabbaq and Ful medames. Arabic unleavened bread, or khobz (خبز), is eaten with almost all meals, and is often used as an edible utensil to scoop foods. Kabsa is considered by many as Saudi Arabia's national dish. Turkish cuisine is largely the heritage of Ottoman cuisine, which can be described as a fusion and refinement of Central Asian, West Asian and Balkan cuisines. Turkish cuisine has in turn influenced those and other neighboring cuisines, including that of western Europe. Yemeni cuisine - The most common Yemeni dishes include: Aseed, Bint Al-Sahn, Fahsa, Fatoot, Fattah, Ful medames, Hareesh, Jachnun, Kabsa, Karees, Komroh, Mandi, Mateet, Mutabbaq, Saltah, Samak Mofa, Shafut, Shakshouka, Thareed, and Zoam. Mandi is a traditional Yemeni dish usually made from meat (lamb or chicken), basmati rice, and a mixture of spices. Levantine cuisine – traditional cuisine of Ottoman Syria, now usually called the Levant, known in Arabic as the Bilad ash-Sham. This region shared many culinary traditions under the Ottoman Empire which continue to be influential today. It covers the modern states of Syria, Lebanon, Jordan, Israel, Northern Iraq, northwest Iraq (the province of Mosul), and parts of southern Turkey near Adana, Gaziantep, Antakya and Mardin. Israeli cuisine comprises a mixture of dishes—from those brought back to Israel by Jews from the Diaspora, those from Jews who remained in the region, and those adopted from surrounding Arab inhabitants. Since before the establishment of the modern State of Israel in 1948, and particularly since the late 1970s, an Israeli fusion cuisine has developed. Ptitim – Israeli toasted pasta shaped like rice or little balls. Jewish cuisine — The cuisine of the Jewish diaspora. Lebanese cuisine includes an abundance of starches, fruits, vegetables, fresh fish and seafood; animal fats are consumed sparingly. Poultry is eaten more often than red meat, and when red meat is eaten it is usually lamb on the coast and goat meat in the mountain regions. Syrian cuisine is a diffusion of the cultures of civilizations that settled in Syria, particularly during and after the Islamic era beginning with the Arab Umayyad conquest, then the eventual Persian-influenced Abbasids and ending with the strong influences of Turkish cuisine, resulting from the coming of the Ottoman Turks. South Caucasus cuisine is the cuisine of the various countries and peoples of the South Caucasus, also known as Transcaucasia. Kabsa is a traditional Saudi Arabian dish. Hummus with pine nuts at the Maxim restaurant in Haifa, Israel. Fatayer is a meat pie or pastry that can alternatively be stuffed with spinach (sabaneq), or cheese (jibnah). It is eaten in Turkey, Syria, Lebanon, Jordan and other countries in West Asia. Fahsa is a famous Yemeni dish, containing beef or lamb meat cooked in a stony pot called Madara. ^ "Cuisine." Thefreedictionary.com. Accessed June 2011. ^ "Kazakhstan". foodbycountry.com. Archived from the original on May 20, 2011. Retrieved April 18, 2011. ^ "The noodle-rich cuisine of Uzbekistan" Archived 2007-12-11 at the Wayback Machine, The Village Voice, Dining, 19 January 1999. ^ "Fujian Cuisine. Archived 2013-07-31 at the Wayback Machine Beautyfujian.com Archived 2011-07-10 at the Wayback Machine. Accessed June 2011. ^ "Regions of Chinese food-styles/flavors of cooking." Archived 2011-10-05 at the Wayback Machine University of Kansas Archived 2011-10-05 at the Wayback Machine, Kansas Asia Scholars. Accessed June 2011. ^ J. Li & Y. Hsieh. Traditional Chinese Food Technology and Cuisine. Asia Pacific Journal of Clinical Nutrition. ^ Hsiung, Deh-Ta. Simonds, Nina. Lowe, Jason. (2005). The food of China: a journey for food lovers. Bay Books. ISBN 978-0-681-02584-4. p17. ^ TVB. "TVB Archived 2010-11-01 at the Wayback Machine." 廣東菜最具多元烹調方法. Retrieved on 2008-11-19. ^ Marshall Cavendish Corporation (2007). World and Its Peoples: Eastern and Southern Asia. Marshall Cavendish. p. 126. ^ "Beijing 2008 Olympics - Zhejiang Cuisine". People's Daily Online. 2008. Archived from the original on 2011-06-05. Retrieved 2008-09-22. ^ Bourdain, Anthony (2001). A Cook's Tour: Global Adventures in Extreme Cuisines. New York, NY: Ecco. ISBN 0-06-001278-1. ^ "A Day in the Life: Seasonal Foods" Archived 2013-01-16 at the Wayback Machine, The Japan Forum Newsletter No. September 14, 1999. ^ "Japanese Cuisine. Archived 2011-06-25 at the Wayback Machine Thefoodieshandbook.co.uk Archived 2016-02-18 at the Wayback Machine. Accessed July 2011. ^ (in Japanese) "「ミシュランガイド東京・横浜・鎌倉2011」を発行　三つ星が14軒、二つ星が54軒、一つ星が198軒に" Archived 2010-11-29 at the Wayback Machine, Michelin Japan, November 24, 2010. ^ Ishige, Naomichi. "Food Forum Okinawa Archived 2008-05-17 at the Wayback Machine." Kikkoman. Retrieved on November 30, 2009. ^ The Chosun Ilbo. "Hanjeongsik, a full-course Korean meal." English.chosun.com Archived 2003-07-07 at the Wayback Machine. Accessed 6/11/2008. ^ "Korean Cuisine (한국요리 韓國料理)" (in Korean). Naver / Doosan Encyclopedia. Retrieved 2009-03-28. ^ a b c Le, C.N. (2008). "Asian Cuisine & Foods". Asian-Nation: The Landscape of Asian America. Archived from the original on 2009-01-14. Retrieved 2008-12-18. ^ a b "Indian Cuisine." Archived 2018-02-19 at the Wayback Machine VisitSingapore.com Archived 2018-05-07 at the Wayback Machine. Accessed July 2011. ^ "www.indiaat60.in/backgrounders/Incredible-India@60-indian-cuisine.pdf" (PDF). Archived (PDF) from the original on 2017-10-11. ^ Chandra, Sanjeev (2008-02-07). "The story of desi cuisine: Timeless desi dishes". The Star. Toronto. Archived from the original on 2008-10-26. ^ "Indian Grocery Online, Food Shopping Store, Buy, Indian Cuisine". Archived from the original on 2009-07-26. ^ "History of Indian Food and Cooking". Archived from the original on 2013-05-26. ^ "Food - VegVoyages". Archived from the original on 2009-06-28. ^ "Food & Recipes - Asia Society". Archived from the original on 2001-05-25. ^ "Of Vajri Curries and Trotter Khudis - East Indians? | TheWingedFork". The Winged Fork. 2017-07-25. Retrieved 2018-10-21. ^ "Goat Tripe - Vajri Khudi Curry : East Indian Series | TheWingedFork". The Winged Fork. 2018-05-04. Retrieved 2018-10-21. ^ "Special East Indian Chicken Tope - East Indian Series | TheWingedFork". The Winged Fork. 2017-10-13. Retrieved 2018-10-21. ^ "Cuisine of Brunei". ifood.tv. Archived from the original on 2012-08-29. Retrieved 2010-09-30. ^ "Philippine Cuisine." Archived 2011-06-16 at the Wayback Machine Balitapinoy.net Archived 2011-07-23 at the Wayback Machine. Accessed July 2011. ^ Alejandro, Reynaldo (1985). The Philippine cookbook. New York, New York: Penguin. pp. 12–14. ISBN 978-0-399-51144-8. ^ Civitello, Linda (2011). Cuisine and Culture: A History of Food and People. John Wiley and Sons. p. 263. ISBN 978-1-118-09875-2. ^ Philippines Country Study Guide. Int'l Business Publications. 2007. p. 111. ISBN 978-1-4330-3970-6. ^ a b c "Indonesian Cuisine." Archived 2017-08-23 at the Wayback Machine. Accessed July 2011. ^ "Indonesian food." Archived 2012-02-02 at WebCite Belindo.com Archived 2011-09-07 at the Wayback Machine. Accessed July 2011. ^ "Indonesian Cuisine". Diner's Digest. Archived from the original on 2011-04-09. Retrieved 2010-07-11. ^ "Stung Treng". Archived from the original on 2010-06-13. ^ "Thai Food - Regional Thai Cuisine by Sawadee.com". Archived from the original on 2011-09-17. ^ "Malaysian Food." Archived 2013-06-06 at the Wayback Machine. Accessed July 2011. ^ "What is Malay Food?" Archived 2013-05-25 at the Wayback Machine Malaysianfood.net Archived 2013-06-06 at the Wayback Machine. Accessed July 2011. ^ a b c "Singapore Food." Archived 2011-07-05 at the Wayback Machine Singaporefoodhistory.com Archived 2011-07-05 at the Wayback Machine. Accessed July 2011. ^ a b c "Modern Thai" Archived 2013-05-27 at the Wayback Machine (food). Sabaiaz.com Archived 2013-05-27 at the Wayback Machine. Accessed July 2011. ^ a b c "The Middle East: Background." Archived 2017-05-26 at the Wayback Machine, Globalgourmet.com Archived 1998-01-26 at the Wayback Machine. Accessed January 2007. ^ Tahini: The Taste of Healthy Middle Eastern Cuisine Archived 2016-07-23 at the Wayback Machine, The New York Times, October 19, 2009. Last visited January 29, 2010. ^ Daisy Martinez (2010). Daisy: Morning, Noon and Night: Bringing Your Family Together with Everyday Latin Dishes (Hardvocer ed.). Atria. p. 336. ISBN 1-4391-5753-7. ^ Philip Mattar (2004). Encyclopedia of the Modern Middle East & North Africa (Hardcover ed.). Macmillan Library Reference. p. 840. ISBN 0-02-865771-3. ^ a b Cuisine in Bahrain Archived 2011-05-04 at the Wayback Machine. Allo' Expat Bahrain Archived 2011-05-02 at the Wayback Machine (Website). Accessed April 2011. ^ a b "Foods of Iraq: Enshrined With A Long History - ThingsAsian". www.thingsasian.com. Archived from the original on 2011-05-13. ^ a b "Food in Saudi Arabia" Archived 2012-09-05 at the Wayback Machine. Food in Every Country (website). Accessed May 2010. ^ Aarssen, Jeroen; Backus, Ad (2000). Colloquial Turkish. Routledge. p. 71. ISBN 978-0-415-15746-9.